Place onions in a 5-qt. slow cooker; add ribs and bay leaf. Combine the beer, brown sugar, mustard, tomato paste, thyme, bouillon, salt and pepper. Remove meat and vegetables to a serving platter; keep warm. Skim fat from cooking juices; transfer juices to a small saucepan. Combine flour and water until smooth. Gradually stir into the pan. Serve over your favorite starch, mashed potatoes, rice or riced cauliflower. Try different beers. 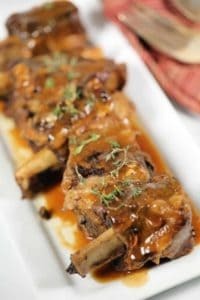 Guinness is a favorite for braising ribs or similarly add a full bodied red wine, such as Cabernet. These beef ribs freeze beautifully.